Didi Gregorius hits grand slam in the sixth after Joe Mauer's slam gave the Twins a 10-1 lead. It’s the A’s, steadily gaining ground. 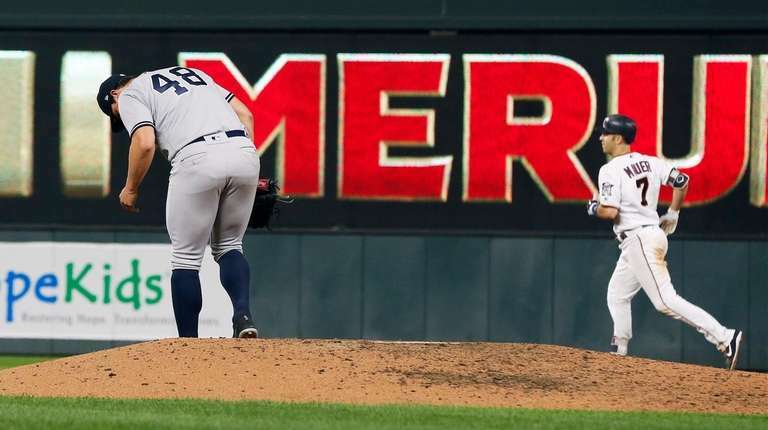 With Sonny Gray not providing much in a spot-start and the bullpen mostly dreadful, the Yankees took it on the chin in a 10-5 loss to the Twins in front of 20,343 at Target Field. The Yankees (90-55), now 4-4 on this nine-game trip that ends Wednesday night, saw their lead over the A’s for the top wild-card spot trimmed to two games and their deficit to the Red Sox in the AL East grow to nine games with 17 to play. Tuesday the A’s started a three-game series against the Orioles, who have the worst record in the majors, with a victory. And though Aaron Boone didn’t exactly rip his club afterward, he was as pointed as he’s been all season about a group that’s 7-8 in its last 15 games. That hasn’t happened of late and if it doesn’t, Brett Gardner said, it could be a brief October for a team that, while still not in danger of missing the playoffs, is a bad finish away from having to travel for the wild-card game, which presumably will be against Oakland (or Houston if the Astros blow their three-game division lead). And now the spotlight shifts to the struggling Luis Severino, 4-5 with a 6.83 ERA in his last 11 starts, who gets the ball Wednesday night. Gray, who came in with a 1.83 ERA in six games since his demotion from the rotation — that did include a spot start Aug. 25 in Baltimore — was not good Tuesday. Inserted in the rotation this time through to give Severino and other starters some extra rest, Gray (10-9, 4.99) allowed three runs (two earned), four hits and three walks in three innings. He departed with the Yankees in a 3-1 hole, one that grew to 4-1 in the fourth when rookie Jonathan Loaisiga allowed a run and 10-1 in the fifth when Loaisiga and Tommy Kahnle combined to allow six runs. Kahnle came on with the bases loaded in the fifth and gave up a grand slam to Joe Mauer that made it 10-1. One Yankees bright spot was Didi Gregorius, who hit a grand slam in the sixth to make it 10-5 and give the shortstop 23 homers, two shy of his career high set last year. Gregorius, activated from the DL on Friday, also tripled and scored in the second inning for a 1-0 lead. The Twins (66-78) went with righty reliever Tyler Duffey as their “opener,” and the 27-year-old allowed one run and two hits over two innings. Four relievers went the rest of the way.